Many of us start the year with intentions to be more active. We all know that being more active in our everyday life can help us improve our health, and feel better day-to-day. So why is that, after setting out with the best of intentions, it can be so hard to keep up the active habit? Unfortunately, life can get in the way – so many of us are pushed for time, or have other important things that need to be done before we can even think about doing exercise, like looking after kids, caring for elderly relatives or just getting on with household chores. 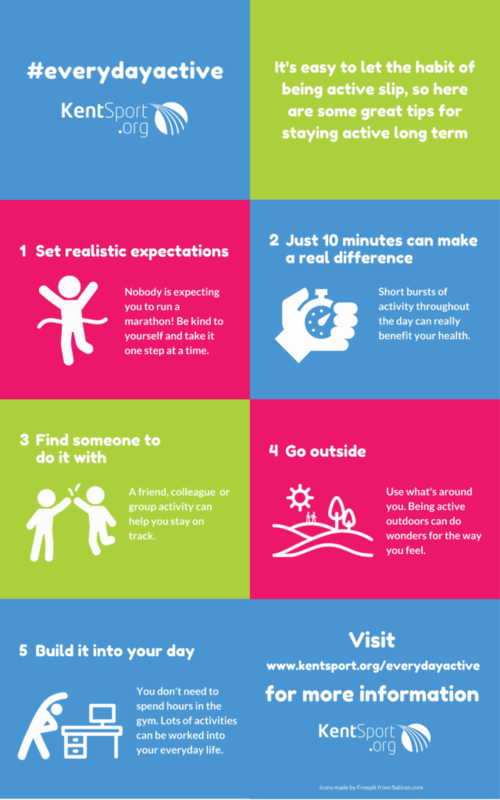 As part of our #everydayactive campaign, Kent Sport have put together a simple list of tips and suggestions for easy steps that can help you to become more active in the long term. The key is to be realistic with your expectations from the outset, find a way to work activity into your day, and if possible share the experience with someone else. Take a look at our infographic below, and for more information and inspiration to help you with each of the tips, click on the button below. If you require this infographic in an alternative format, please contact kentsport@kent.gov.uk.